Disney's Contemporary Resort is a deluxe hotel within the Magic Kingdom resort area of Disney World. This is one of two original Disney World resorts and one of three WDW hotels on the Disney monorail loop. The unique thing about this resort is that the monorail comes right through the center of the building and the station is inside. The monorail is electric so it is quiet and does not have fumes. The monorail and close proximity to Magic Kingdom make this a popular choice and the resort frequently fills to capacity. The first Disney Vacation Club (DVC - Disney's timeshare program) building on the monorail loop is built here. There are other DVC locations but none so close to the monorail nor the Magic Kingdom. The new building is called Bay Lake Tower. The North Garden Wing of Disney's Contemporary Resort was torn down to make room for Bay Lake Tower. Advantages - Very comfortable resort with lots of onsite amenities like dining and shopping. You can watch the Electric Water Pageant and Wishes Fireworks from the resort beach. 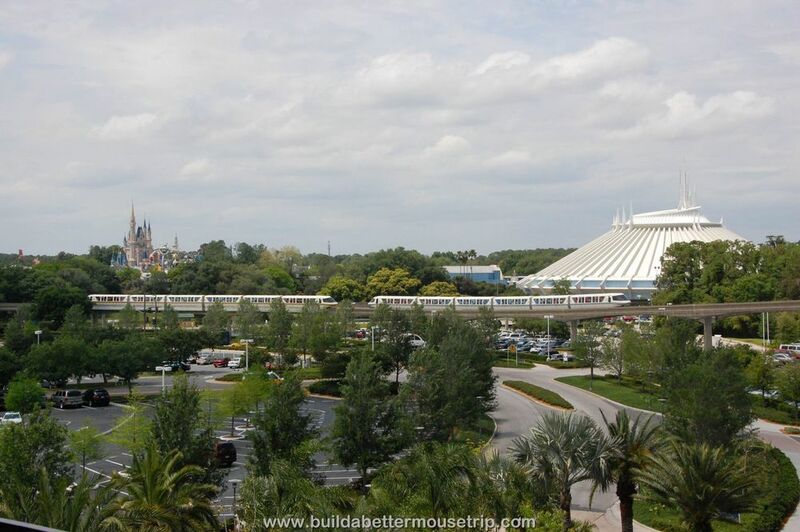 The monorail makes it easy to get to the Magic Kingdom. Proximity to the Grand Floridian & Polynesian Resorts greatly expands your dining options. The Garden Wing -Standard View rooms are often the least expensive rooms within the Magic Kingdom - Monorail Loop resort hotels. The Contempo Cafe food court was recently refurbished and is one of the better food courts on Disney property with a nice selection of food choices. Disadvantages -This resort is expensive, especially the theme park view rooms. At times, the lobby will have a lot of non-resort guest who come for the restaurants or just to check out the resort. The Contemporary Resort doesn't carry as heavy a Disney theme in its decor - this can be an advantage or disadvantage, depending on your perspective. 2 Swimming pools - one with a water slide and a quiet pool. Sandbar - Pool Bar - Serves burgers, sandwiches, specialty drinks, beer, sodas, etc. Contempo Cafe - quick service restaurant with sandwiches, salads, and snacks. California Grill - (dinner only) Upscale California style cuisine dining on the 15th floor. This restaurant has a balcony with a great view of the Magic Kingdom fireworks, although reservations at those times go quickly. Chef Mickey's Character Breakfast or Dinner Buffet - Enjoy breakfast or dinner with Lilo & Stitch, Mickey Mouse, and Pluto. Reservations highly recommended. The Wave - Table service restaurant serving breakfast, lunch, and dinner. In Room Dining - room service. Bayview Gifts (BVG) - a large shop with souvenirs, collectibles, casual fashions, watches, jewelry & more. Concourse Sundries & Spirits - magazines, health & beauty items, snacks & liquor. Groceries: You can save time and money by having more extensive grocery needs, snacks, and bottled water delivered directly to the resort by Garden Grocer - Click HERE for more information. Regular hotels rooms do have mini-refrigerators but do not have full kitchens. Studio-style units have mini-refrigerators and microwaves. One-bedroom or larger villas come equipped with a full kitchen. Rates: Room rates will vary by season and promotion but start around $270 per night and climb to over $2000 per night for the Presidential suite. Garden Wing Rooms - These rooms are in a separate three-story building and are some of the least expensive rooms found in the three Magic Kingdom -Monorail Loop hotels (Disney's Grand Floridian, Disney's Polynesian, and Disney's Contemporary Resorts). The decor of the rooms is just like that of the rooms in the main tower. Most of the first floor rooms have shared patios but the upper floors do not have balconies. These rooms are close to the marina and swimming pools. Standard View rooms overlook parking areas while Garden View Rooms overlook the water or resort. Walking from Disney's Contemporary Resort's Garden Wing to the Main Tower. There is a covered (but not enclosed) walkway that covers most of the distance between the Garden Wing and the main tower. This is a short walk and you'll stay dry under normal rainy conditions. If you're headed to the monorail, you'll take the walkway to the main Tower building; once inside, you'll take the elevators or escalators up to the 4th floor then take another elevator/escalator to the monorail platform. Guests may use Disney's Magical Express - a shuttle bus service included in your reservation - between the Orlando International Airport and Disney's Contemporary Resort. The monorail travels to the other Monorail loop hotels (Disney's Polynesian Resort and Disney's Grand Floridian Resort), to the Magic Kingdom theme park, and to the Ticket and Transportation Center where you can catch another monorail over to Epcot. Guests also have a water launch/boat option for travel to the Magic Kingdom. There is another boat that will take you to Disney's Wilderness Lodge resort and Disney's Fort Wilderness Campground - this opens up extra dining and entertainment options. Disney buses are available to take Contemporary hotel guests to Disney's Hollywood Studios and Animal Kingdom theme parks, Typhoon Lagoon & Blizzard Beach Water Parks, and Downtown Disney. I feel a lot of affection for this hotel because this was the first Disney hotel I ever stayed in (age 13). It is just very cool that the monorail comes right into the resort. My wife, however, doesn't have any nostalgic Contemporary resort memories so she would rather stay in any other Disney resort because this one just doesn't feel "Disney" to her. Some people find this a welcome break from the Disney sensory overload you find in the parks. There tends to be more adults and older travelers in this resort which can be a bonus for those who don't want to be overrun with small children. We provide Disney theme park touring plans that are designed to let you do all the things you want to do in a way that keeps you ahead of the crowds and out of the long lines. These are provided at no extra charge when you book your Disney vacation through Build A Better Mouse Trip. "When we stayed there as parents of younger [stroller bound] kids it was really lovely to be able to walk to and from their favorite park MK, no one got the 'bus sleepies' there was no waiting and it was a nice calming beautiful walk - plus it made us feel like the MK was in our 'backyard' - for us that gave it a VERY Disney feeling!"